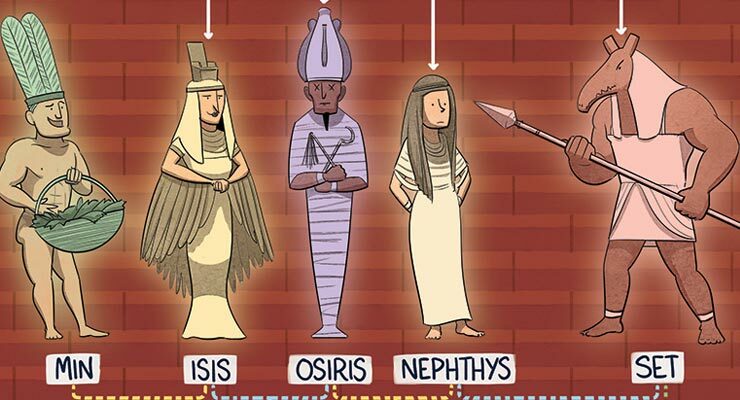 The below image, created by Korwin Briggs at Veritable Hokum, depicts a cartoon family tree of the Egyptian gods. It’s an incredibly fun take on the often confusing subject of Egyptian divinities. The Egyptian gods—like Isis, Osiris, Set, Horus, Thoth, Anubis, and lots more—were an incredibly diverse group. Like the Greek and Roman gods (which were probably inspired by their structure), the Egyptian gods were often arranged into family units—although they weren’t always families that got along. For instance, the “first family” of the Egyptian gods consisted of Isis, Osiris, Horus and Set—mother, father, and their two rival sons. Infamously, Set put out his brother Horus’ eye, and then dismembered his father Osiris, scattering his body parts across the world. Isis was forced to go searching for her husband’s body parts, locating them all (except the genitalia!) and piecing them back together to finally resurrect him. The Egyptian gods were apparently much more abstract and less human than the gods that came after them (like the Greek and Roman gods), seeming to represent much more intellectual concepts than many pagan gods (who often seemed much more human). This can be seen by the frequency with which the Egyptian gods (like Thoth, Anubis, Horus, Sekhmet and many more) are shown with animal gods, appearing as strange animal/human hybrids that look unearthly, and like completely new species of beings. There’s no wonder the Egyptian gods continue to maintain such a hold on our imagination, fascinating us from across the millennia with not just their appearances but their stories and, most of all, their aura of sorcery and occultism. And speaking of sorcery and occultism… If you’re interested in learning how to talk to the gods yourself (yes, it is possible, even if they just represent archetypes in the unconscious mind), check out Ultraculture’s free course on chaos magick. You’ll learn everything you need to master the basic skills necessary to interact with godforms—and you’ll easily be able to apply it to invoking the Egyptian gods once you learn the basics. Take a look at the Egyptian gods below! Hi there,I log on to your blogs named “Incredible Family Tree of the Egyptian Gods and Goddesses” like every week.Your humoristic style is witty, keep doing what you’re doing! And you can look our website about powerful free love spells.